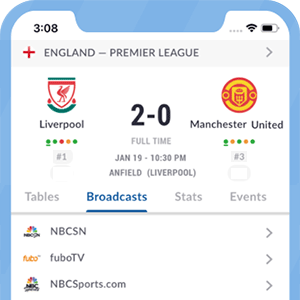 The Live Soccer TV app is a comprehensive soccer / football TV guide with match schedules for official broadcasters around the world. Please note that the Live Soccer TV app does not stream or link to any live matches or provide any links to illegal/pirated streams. Official multi-platform broadcasts including TV, Radio, Online / App / Mobile streaming listings for the most popular leagues, cups and competitions. Links to official live video and audio streams by region per match. Team fixtures, results, match stats, lineups, live match commentary. League standings and top scorer tables. Local channel listings by day, team, or competition. Daily breaking football / soccer news, viral content and editorials. Favorite team kick-off reminders with local broadcast info. Match schedule integration with your device's calendar. Option to hide scores for those who want to watch later without knowing the result. Red and blue color app themes. Comprehensive broadcast data coverage for all major competitions including the all top leagues, cups & competitions, including the UEFA Champions League, UEFA Europa League, English Premier League, FA Cup, La Liga, Copa del Rey, Bundesliga, Serie A, Coppa Italia, MLS, Ligue 1, Copa Libertadores, Copa America, Liga MX, Liga PT, World Cup and UEFA Euro 2016 etc. Multi language support (English, Dutch, French, Italian, German, Spanish, Portuguese (Brasil) and Portuguese (Portugal) and Turkish. Local broadcast rights listed by competition and channel.